This was painted for (and sold at) the Arizona Fine Art Expo. The painting is of a beautiful spot my husband and I hiked through in Glacier National Park. 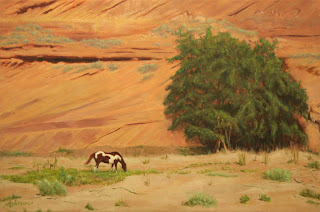 Although you won't be able to see this painting--it's found a new home--I hope you will stop by the Expo in Scottsdale. The show will continue until March 30th, and I've painted lots of new paintings that I haven't had time to post yet. In addition to seeing this incredible show with 100 artists, you can sit in the sculpture garden and enjoy 80+ degree weather. What a double bonus! 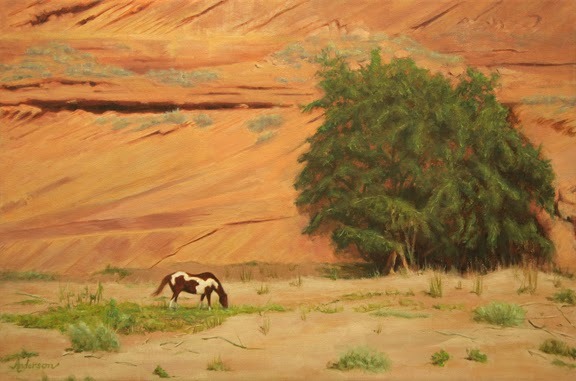 "Afternoon Sun in Canyon de Chelly"
A couple of years ago my husband and I visited a friend of ours on the Navajo Reservation, and we all went on a day-long jeep ride through Canyon de Chelly. What an amazing place! Massive canyon walls, incredibly shaped spires and rocks, color everywhere--it's an artist's dream. If you ever have the chance to go, find someone who can take you back into the side canyons. You won't regret it. 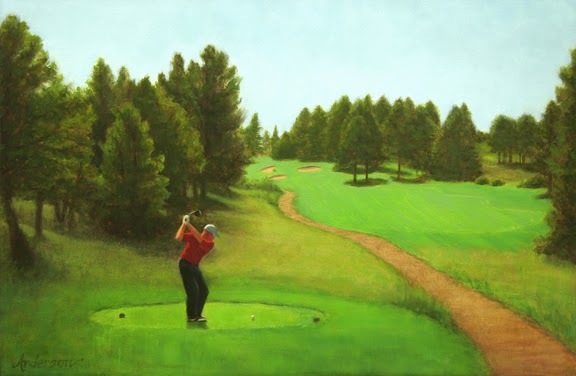 My idea of a beautiful day is to be plein air painting, and husband's is to be playing golf. On one of his rounds I asked him to take some photos for me, and they became the inspiration for this painting. When I asked him what he thought the title should be, he instantly came up with "It's a Beautiful Day." I'm looking forward to my winter in Arizona, where I will definitely not be playing golf. 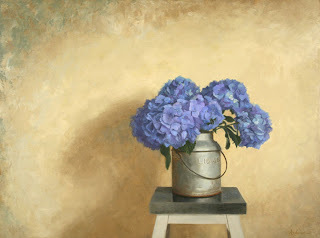 I hope you will stop by and see what I am doing at the Arizona Fine Art Expo in Scottsdale, Jan 16th through March 30th. I will be showing my work and painting at the Arizona Fine Art Expo again this coming January 16th to March 30th. If you're in Scottsdale, I hope you'll drop by and say hello. The address is 26540 N Scottsdale Rd, Scottsdale, AZ 85255 (southwest corner of Scottsdale Rd and Jomax.) Another winter in the sun--yes! 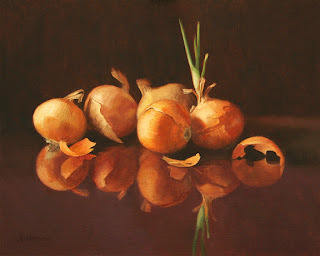 I have entered this painting into the BoldBrush painting competition for May. You can vote for it by going to the BoldBrush website and clicking on the "Like" button. Thanks so much for your support! It's hard to believe this ten week show is almost over and that there are only five days left. 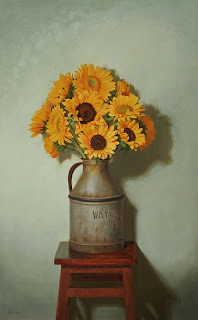 Thanks so much to all of my wonderful new collectors and to all of you who have had so many kind words about my art work. Your support is greatly appreciated! Thanks also to my new artist friends. Your friendship, encouragement and advice have made these past ten weeks not only a great learning experience but also lots of fun. We've "weathered" everything together from 40 to 97 degree days in the tent, to Galas and Garden Parties, and have managed to do it with style! I hope you had a chance to see my painting in American Art Collector's December issue. This view is looking east on 17th Street in downtown Denver, and it was chosen by gallery owner Chris Serr to be in Abend's two-page ad for the Holiday Miniature Show. 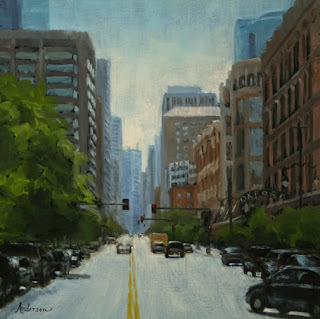 The show started last Friday, and I was lucky enough to sell two paintings on the first night. Early Morning Tuscan Fog (shown on Nov. 4th's posting) and Union Station Reflections (shown below) have both gone to good homes. I was in Union Station on the same day that "Sunday on 17th" was conceived, but this painting took a lot longer to be born. I must have taken over 200 photos that day, and over the months I kept coming back again and again to this photo inside the station. When I finally started playing around with the photo and cropping it different ways, I realized that it was just a tiny portion of the photo that kept bringing me back. 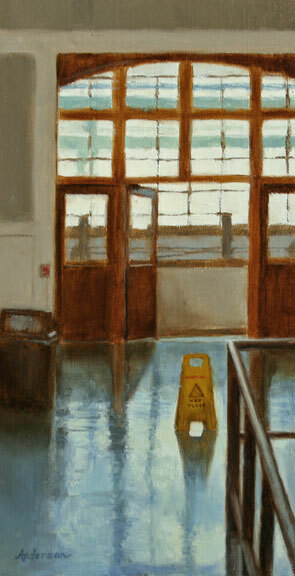 The sun shining through the large expanse of windows had created beautiful turquoise reflections on the floor, and in the middle was this lonely yellow "wet floor" sign that was just begging to be painted. So now, whether I'm plein air painting or composing with a camera, I try to remember to look at both the trees and the forest, because sometimes it is the little things that count the most. In this very busy time of year I hope you are finding time to keep track of and enjoy the little things in life. Painting is truly an obsession for me. Almost every thought I have is never more than two steps removed from painting, and since you are reading this I'll assume you are "similarly afflicted." So join the discussion and we'll see where this leads us. "The only difference between an artist and a lunatic is, perhaps, that the artist has the restraint or courtesy to conceal the intensity of his obsession from all except those similarly afflicted."